Here I'll be posting newly finished work, work in progress, inspiration or revisiting old works. This is where I will give more of a back story about how a piece has developed and an insight to my process. Where in the world is Georgette? …She’s back in New Zealand. My apologies for the radio silence from me all year. 2019 has started off with a bang! 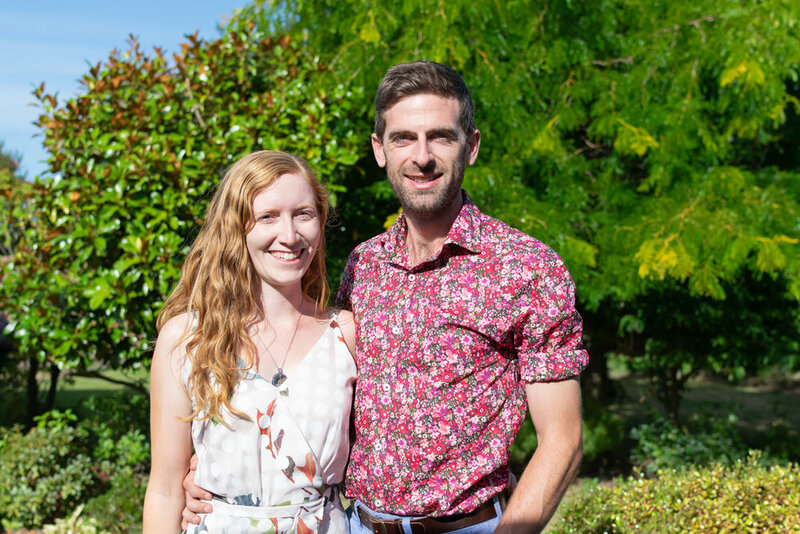 It started with our engagement at the end of last year. Mark proposed at our favourite sailing spot - Charteris Bay in Lyttelton Harbour. Down by the waters edge at the boat ramp, the love of my life asked me to marry him, and of course I said YES! This made for an extra happy New Years Eve! We wanted to celebrate our engagement with family and friends at our home, but needed to do alterations to our deck first. There’s nothing like a deadline to get things done! 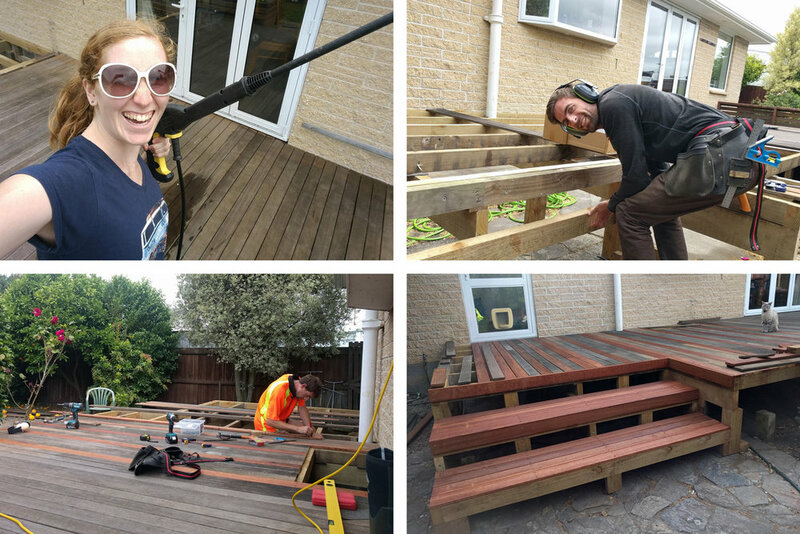 So all of January saw us demolishing and completely re-building half of the deck! The party was on a perfect Summer’s day so everyone got to enjoy our handiwork. Mark and I building the deck. Mark and I at our engagement party standing on the deck. In March we flew to Japan for 2 1/2 weeks of adventure, culture, history and craziness. Highlights included: tree skiing at Kiroro ( in Hokkaido), a cooking lesson in Osaka, singing Karaoke with the locals till 3am, dressing up in a kimono in Kyoto, and the madness of the robot restaurant in Tokyo. If you are visiting Japan I highly recommend the Tokyo Metropolitan Art Museum and teamLab Borderless Tokyo (Digital Art Museum) - this exhibition was full of colourful interactive projections, lights, lanterns and fun. An exhibition you can easily get lost in! While in Japan I decided to treat myself with a visit to Pigment - the most stunning, well designed art store I have ever seen. The Japanese have an effortlessly elegant approach of presentation, and Pigment was no exception. I treated myself to some beautiful traditional sumi brushes, bamboo paper and a gold leaf kit. I am looking forward to trying these out! I have been busy working on the Nasbey landscape oil painting. I am now in the final stages. My list of things left to do is getting smaller and smaller which makes it very exciting. These final details are sometimes subtle and the colour is critical to get right. Therefore I can no longer paint at night as the fake light plays with the colours. So I have a policy to only paint during daylight hours, which means I have to wait to the weekends. I am looking forward to the Easter break to get some day light hours on the piece. Here is it now on the easel. Not far to go! Stay tuned. Thanks for stopping by. Working in progress, Naseby oil painting, 1620x760mm. 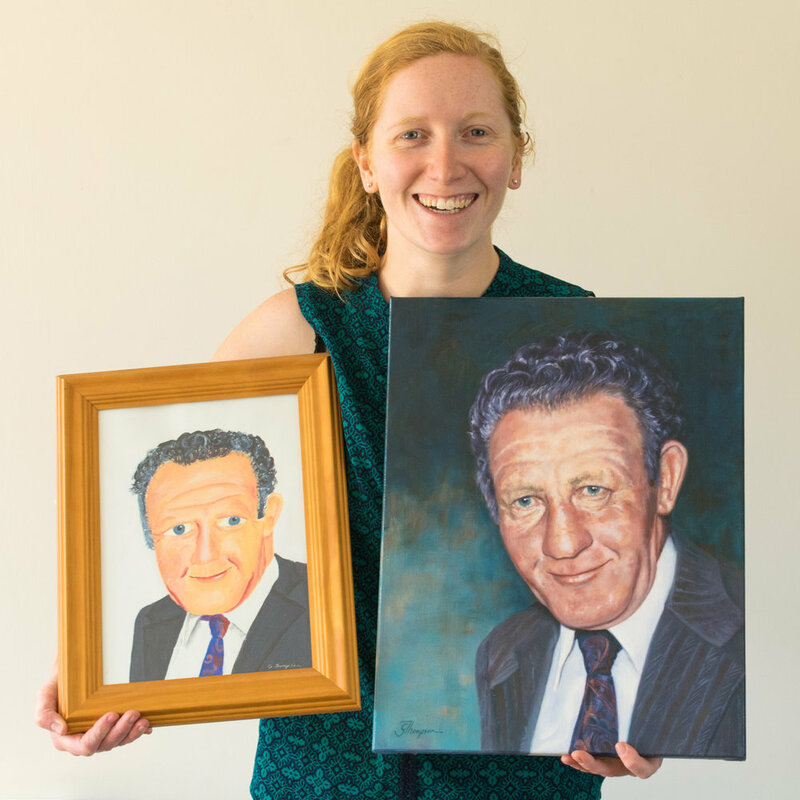 Last year I finally plucked up the courage to paint my Grandfather. It had been 13 years since my first attempt. After my first attempt I hoped one day I could paint him more realistically and vowed not to paint him again until I could do him justice. I never got to meet my Grandad Jack, but grew up hearing stories about him. The photograph I painted from was in pride of place in my Nana’s flat, usually somewhere prominent like on top of the tv (back in the days when tvs were boxes). I knew this was a special photo of him. I painted this portrait as a gift for my Aunty, but I had a feeling that it would be special to the whole family. I hope that I have done him justice. I am proud of my attempt and I hope he is proud of me. During the early stages of the portrait I mapped out his face with monochromatic washes (shown directly below), focusing on form and light. These washes ran like tears around his eyes. This was an emotional moment for me, as I sensed we were connected in our mutual loss of never having met. Through the process of building the layers I felt I learnt more about the man I had heard so much about. Value study. Close-up on the right. Below you can see a comparison between my two attempts. As you can see, I’m pretty chuffed with the final result of the painting. Below this is a video showing the painting form - I took a photo at the end of each work session and compiled these into a video. I hope you enjoy it as much as enjoyed the painting process! I was curious to compare my left and right hands painting the same scene. I expected the results to be wildly different with wild wiggly lines coming from my life hand. 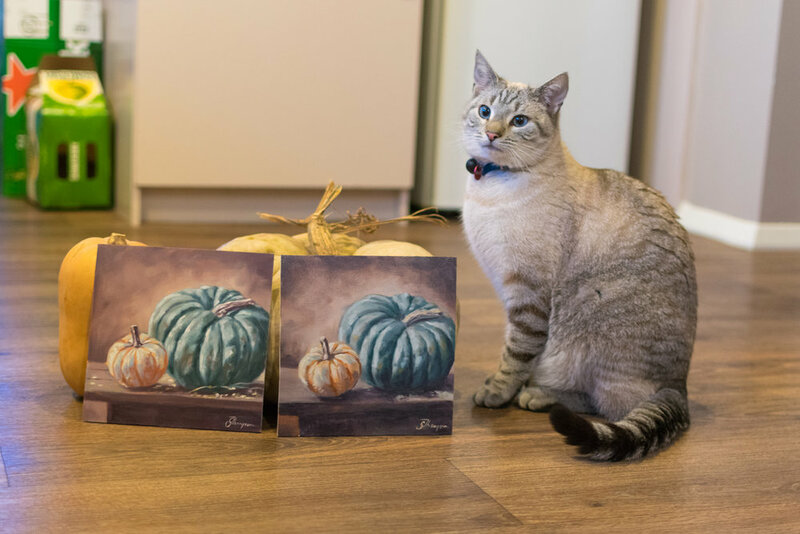 I decided to paint the same scene, a still life of pumpkins, first with my left hand. By going first with my left, then I would prevent "cheating" by passing on any learnings of my right hand of the scene to the left hand. To my surprise my left hand actually achieved realism. Perhaps I had built but pathways in my left hand many years ago when I broken the pinky on my right hand. I had to write using my left hand for several weeks! I was able to use my same painting process, building up the layers the same way as I usually do and it came together. I was certainly slower and more frustrated using my left but it worked. I was amazed at how tiring it was using my left hand! Bentley is very proud of his work! A time lapse of a painting I created in 2017. Watch 'Tractor Heaven' come to live throughout the layers. This is a view of Paton's Rock beach in the Golden Bay area of New Zealand's South Island. I was holidaying here one summer and was very curious as to why the tractor would sit out there for hours. If you watch closely you can see when I changed the size of the tractor dramatically. Finished and sitting on the easel. I've been thinking that there are some parallels between my need to paint and descriptions of addiction. But addicted in good way. Looking back there were signs even at a young age. My Aunty Mary took me away for a beach holiday to one of our favourite beaches when I was five or six. It was a wonderful time but we hadn't packed any drawing paper. As soon she returned me home I dove into the hot water cupboard where the scrap paper was stored and then furiously started drawing out ideas on the floor. My Aunty commented that obviously I had been missing drawing equipment! During primary school images were much easier for me to relate to than words. And word soon got out that I could draw. Kids would pass their books down the table for me to draw up a fancy title page for the latest topic. Once when I was collected from school I announced I had had the best day ever at school. "We did art all day. We drew pictures and made sculptures. If only school was like that every day!" I still agree with that statement, if only everyday was filled with art. Returning from a fun weekend staying with a friend I was in a really bad mood. After some questioning from my mother I said, "Yes I had fun but I didn't get any of my project work done and I have so many ideas." Nowadays I think about painting all the time. It's like I'm itching to get my next fix. Planning the next strokes on a painting. Seeing a sunrise and analysing how I would mix the colours. Looking at photos and breaking down the shapes in my mind. Looking at a landscape and planning the order of the layers. When there are days when I don't paint I'm anxious to when I can next get on the brushes. And when there are multiple days not painting I'm almost tapping and the table wanting to get back to it. Am I obsessed? I hope I don’t come across that way. I think it is healthy to have a passion and a drive. Everyone needs one. I feel lucky that I have found mine and I discovered it so early on in life. It is comforting that it is something that has always been with me and always will be. It’s like a loyal friend. A young Georgette aged 4 years. Much later in life I painted this as gift for my sister. Picking up on harmonise colours from a young age. Pig, aged 5 1/2 years. A witch with many rings. Aged 8 years. Comic strip of characters I developed aged 10 years. Scotty dog, aged 11 years. Happy family. Vampire family drawing aged 11 years. 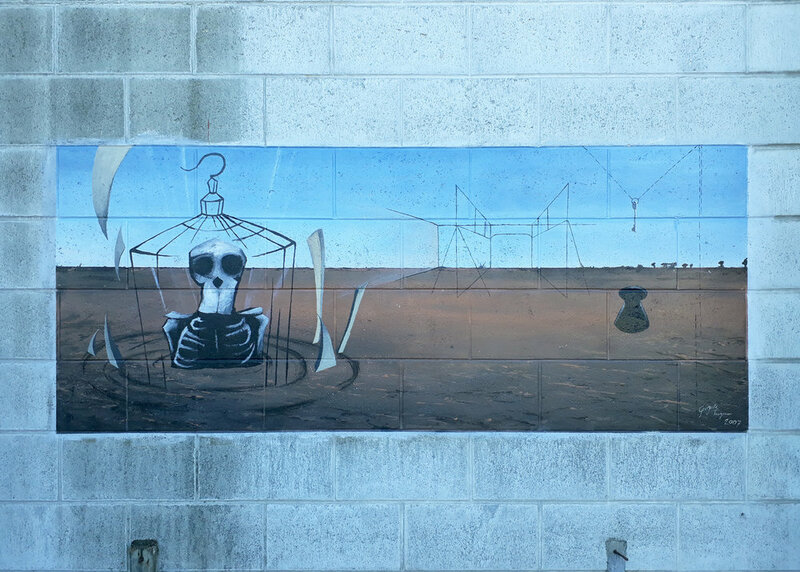 Mural on Ashburton College 2017. Aged 17 years. 'Young Georgette' Acrylic on board, 2007. Aged 17 years. 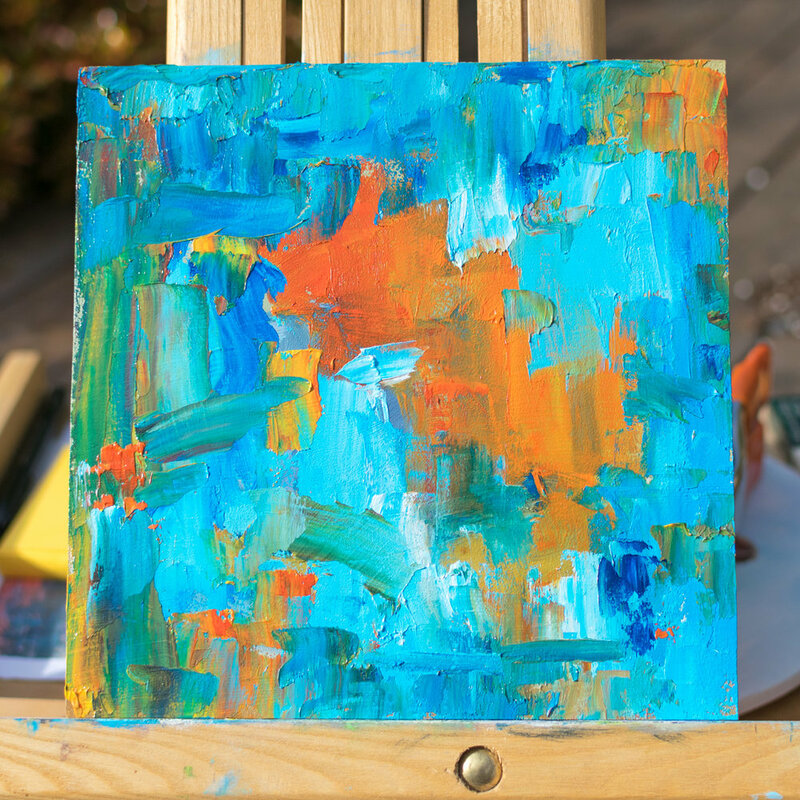 Put simply each artist receives a tiny canvas and a word to express in their own way. The artist returns that canvas and then receives another artist's from somewhere in the world. All the canvases will be scanned to then compile in a visual encyclopedia book. How fun! The word I received was "Mallam". Which I have to admit I had to look up the meaning. "Mallam is an honorific title given to Islamic scholars." I searched around for a figure that advocated for good and came across, Makarem Shirazi an Iranian religious leader. In reference to underage marriage Makarem stated that "although such marriages were permitted in the past, in modern times it has been demonstrated that they are not in the best interest of the parties involved and should be considered invalid". Watch the painting come to life in the time lapse below. Even as I write this one week on from the magazine's release, I still don't quite believe it. 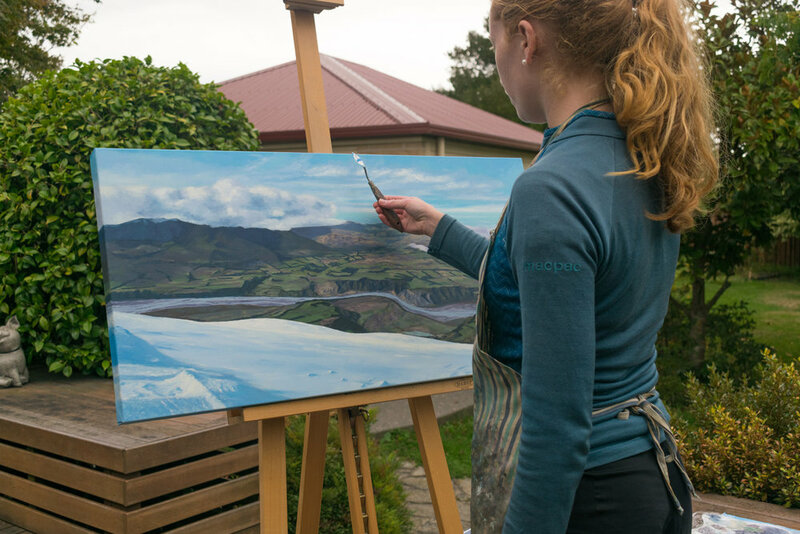 My painting chosen for the cover of the New Zealand Artist! Crazy. I feel very honoured to be have been chosen and it has been quite the buzz this past week. It certainly was the most surreal feeling to walk into the bookstore and see my work staring back at me from the shelves. 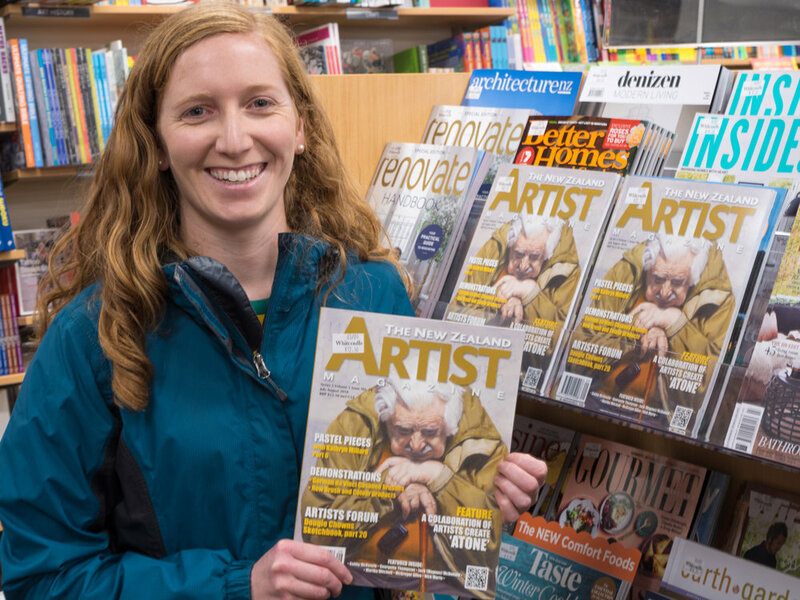 A very excited Georgette holding her cover of the New Zealand Artist magazine at the local bookstore. Close up of the cover. Oh fancy that! Look what found its way onto the coffee table. 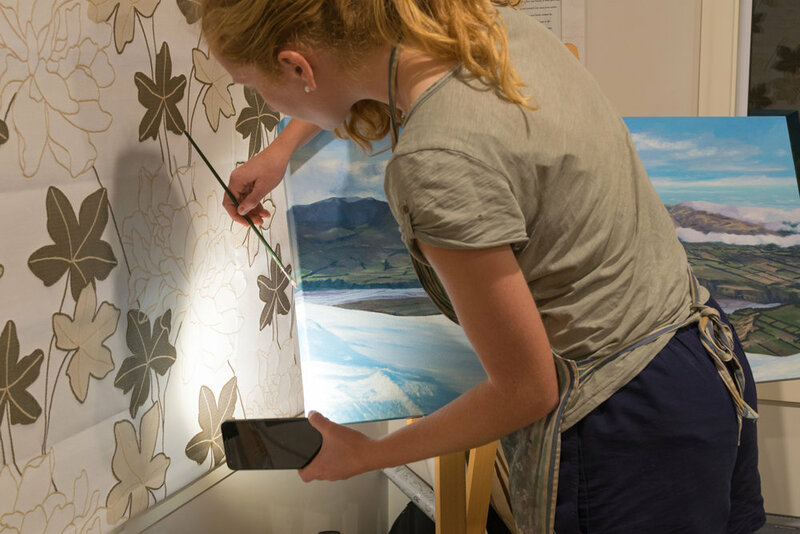 During the painting process there are times when it looks nothing like the final outcome. But the painter has the proceeding layers mapped out in their head. Thankfully Matt enjoyed watching the painting throughout each of the stages. Below you can see some of the steps throughout the project. I have also created a time lapse of the painting coming together. Working at night requires extra lighting. Colour matching is so much easier outside. 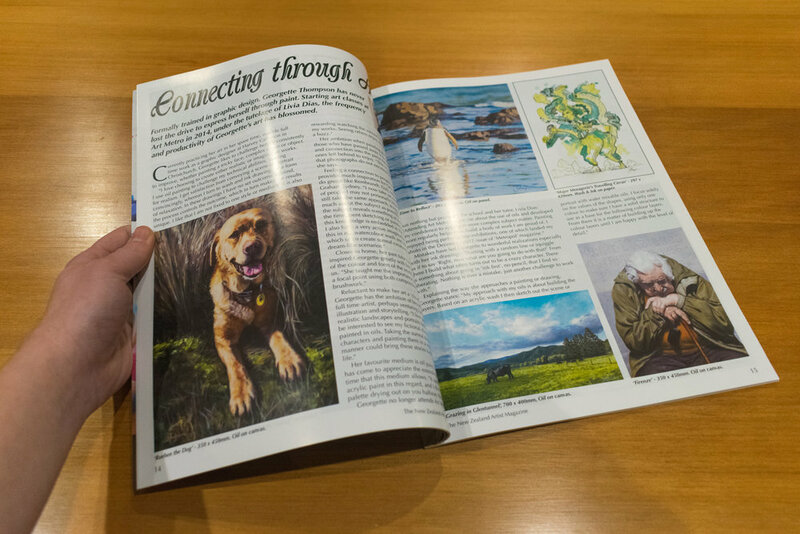 When approached to help with a charity art auction to help raise funds for The Kings and Queen's Kapa Haka group I jumped at the chance to be involved. Each artist was sent out a 'patu' shaped board to paint. Patu is a term used for a broad-blade club used by Māori warriors for close-quarter fighting. When I received the board I ponded what to create. The shape reminded me of a whale with its wide body and narrow tail. Remembering that the patu is a weapon I thought it even more appropriate to paint an animal that needs us to fight for its protection more than ever. It wasn't until writing this blog that I realised that patu were sometimes made from whale bone. I find that almost spokey. Watch below as I build up the layers of 'Under the Blue'. Quite often my portrait commissions are a surprise for someone. It makes it exciting waiting for the big 'reveal'. I finished this painting in December and can finally reveal it to you now. 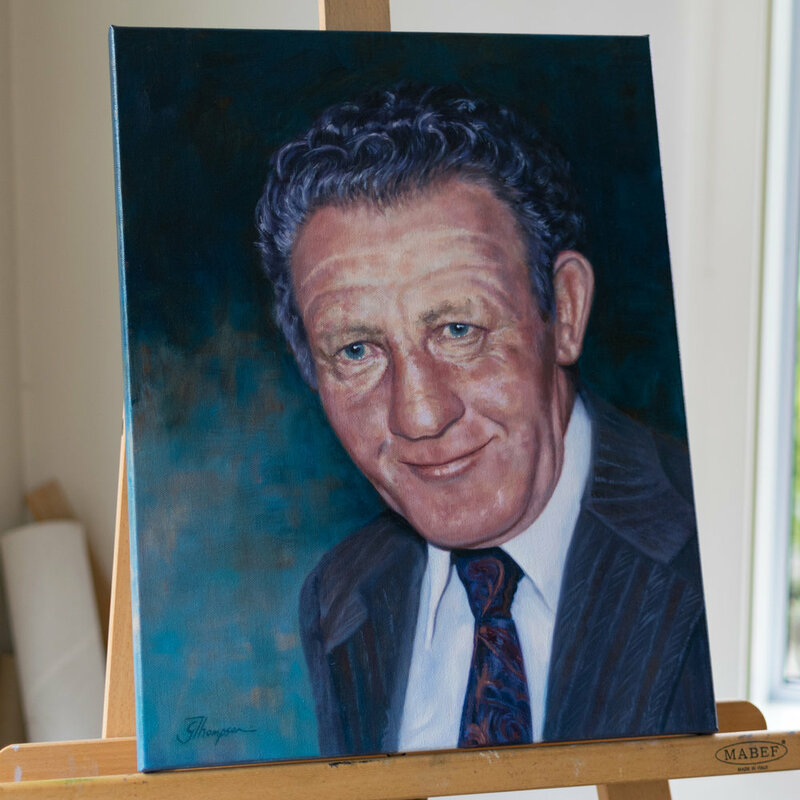 This is a painting of my Great Uncle Alan it was commissioned by his son Colin. Colin flew over from Melbourne to pick up the painting and surprised his mother with the painting. She was delighted. What a beautiful gesture from a son to his mother, just in time for Mother's Day. I have made a behind the scenes video to show the process of the painting coming to life. Check it out below. I had this painting of a summer hat but unfortunately it was damaged, so rather than fixing it I decided to have a bit of abstract fun with it instead. Abstracts aren't usually my thing, I'm not trained in creating these but I felt like a little relaxation 😊 It was a lot of fun and has given me some ideas for future projects I want to try out. Don't you just love the textures and colour combinations here! This painting was such a thrill to create. 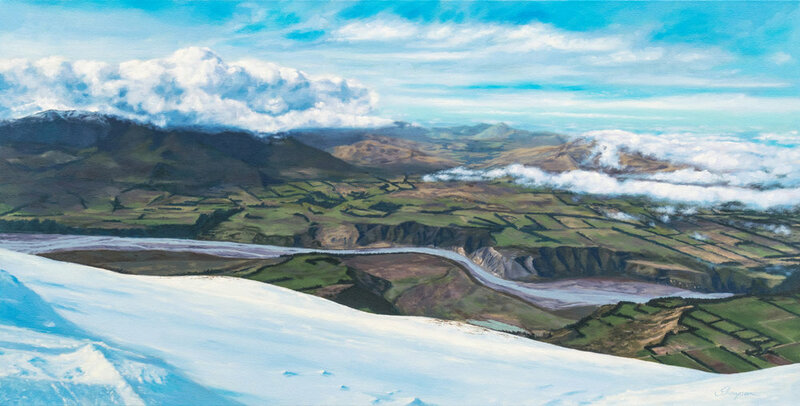 I worked from a photograph I took from a helicopter of Mt Aspiring, New Zealand. How lucky I felt to see this magnificent mountain up close! Watch this artwork come together from sketch through to the final result. To read more about this painting see an earlier post here. 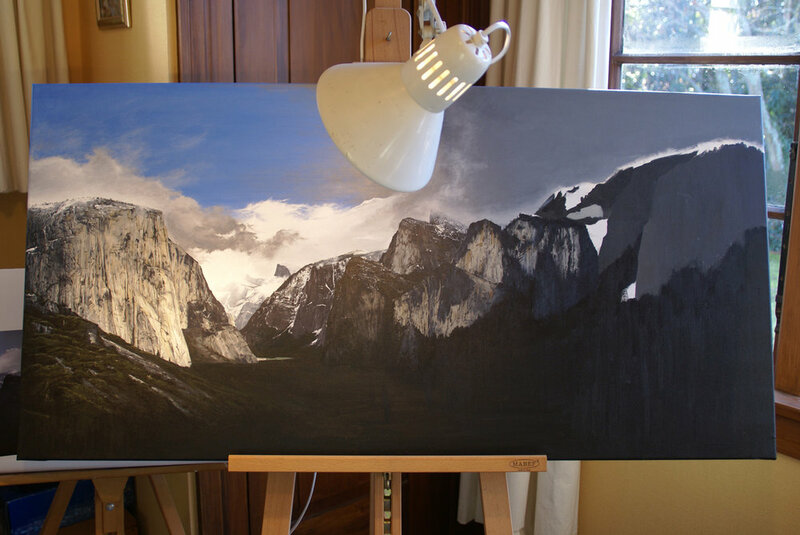 It is hard to believe it has been 8 years since I started painting the Yosemite painting. It took me over a year to complete and it travelled from America to New Zealand with me. Here are some photos of the process and a younger looking me! I had to use two easels to hold up this rather large blank canvas. It was winter time in the States and the sun would go down about 5pm so I was often working under lights. So intent on get the right view point I would kneel for hours. The last progress photo in the States before transporting the painting to New Zealand. Now working in the New Zealand Winter under lights. The final push to the end. I remember small sections would take me hours. The artwork now resides back in the States in California. It took over 125 hours to paint and was one of my most ambitious pieces of that time. The detail of this landscape was a challenge I relished. See some of the detail up close in the photos below. I thoroughly enjoyed this commission last year. An oil painting of Rueben the Dog. I loved the challenge of creating enough mood that dog stood out from the tussocks. This dog had sadly past away so I wanted to bring life back to Rueben through this painting. The client was stoked when she saw it for the first time as a surprise gift. Check out the video below which shows this painting evolve throughout the layers. I had never dreamed at the start of this year that by the end of January I would be exhibiting my work in my own show. Yet indeed this is what happened. With the help of my friend Lorraine I stumbled upon an opportunity too good to miss. A gallery space in the Arts Centre had become available the week of the World Buskers Festival so there would be a greater amount of foot traffic. I had to dispense with the fear and just do it! So with just one week before opening I managed to get together enough of my work to fill the four walls. As well as organising paintings to to be scanned and printed at the printers and getting them produced in time for opening. It was an intense week! This exhibition could not have been possible without the help of many people. Lorraine, who has owned many galleries, manned the show for me throughout the week days. She taught me so much throughout the week about how exhibitions work. My father helped me set up the exhibition on the Monday. My mother and partner supported me during the weekend with manning the show. At times it got very busy so it was so great to have their help. For me it was so lovely to see how the public reacted to my work by seeing what their favourite pieces were and explaining the stories behind those pieces. I was overwhelmed (in the very best way) by the support of friends and family who came in to see the exhibition and feel so honoured to be surrounded by such love. Me looking chuffed at the exhibition. Sketches and prints behind me. Click to the right hand end of this picture above to view more photos. Lorraine and I colour matching with the paintings behind us. The talented work of Chris Thompson. Over the course of the weekend I set up a Go Pro to capture the coming and goings of people during the exhibition. This is just some of the weekend. Recently I got to spend time with my gorgeous wee niece Ginny over the Christmas holiday. Gosh how she had grown since I had painted this portrait. It was wonderful spending time with her and watching her learn to walk. Then she hoped on the plane with her parents back to the US. Here is a video of the process I took to paint this portrait earlier last year. I was such a pleasure to paint, as I knew it would be for my own collection, I could relax into the process more than normal. And obviously I was inspired by the subject too! Enjoy the video. Recently I had a request to show how I create my watercolour washes in my illustrations. Here I go through the whole process explaining my approach. In essence it's all about having fun! It was quite cool recording my first 'How To' video. It was interesting analysing my process to be able to convey it in the video. This was also my first attempt at doing a voice over. It is quite strange hearing your own voice on the video. I took several takes until I had to say "that'll do". This video shows the process I use to create the coloured areas used in drawings like below. Wahoo!! My first ever time lapse of the entire painting process!! I've learned so much and made so many mistakes along the way from filming to editing and spent waay to long selecting the 'right song' but here it is. I wanted to show the whole process from prepping the board right through signing it off. Still getting the hang of filming there were some mishaps along the way. I missed most of the sketching as I hadn't properly hit record and I took 20 minutes of blurry film as I hadn't focused the scene. Compressing many hours of film down to 1 minute is quite the task. What I found super interesting while editing was that well over half the time the brush is not on the canvas. I didn't calculate the percentage but it was rather high. There is a lot of thinking that happens when painting, always planning your next move, and as you know there is no handy undo button. It's always satisfying looking back over the process of a painting in retrospect and seeing it come to life. Throughout the process there are often times when it feels like portions are not working out. It's part of the challenge of painting - resolving areas until you are happy with the final result. Here is 'Grazing in Glentunnel' from start to finish shown in progression. At the end of each step or session I would take a photo. First is the acrylic wash, then a charcoal sketch and then building up the oil layers. It's not every day you get to 'break into' a house to deliver a painting. This was the surprise waiting for the client arriving home from her honeymoon. By 'break into' I mean - let in by the house-sitter to hang the painting in place. Grazing in Glentunnel insitu above the fire place. I started this commission in January, it was to be a surprise wedding gift. So I have been itching to reveal the results - but only after the client had seen it first! Thankfully they arrived home yesterday. I am stoked with how this painting worked out and I am truly going to miss it. I find the colours so typically 'kiwi' and restful yet there is also an energy to vibrant colours. I took a series of photos out at the farm to work from. I returned home thinking I hadn't quite captured the true essence of the place but after a little merging of different shots I came up with a composition that both I and the client were happy with. This was my first time painting a cow I'm quite happy with how this came out. Check out some of the detail photos below. Detail photos - click on the right side of the photo to see more.